"The Brothers Schlemiel is a delicious and exciting novel of mixed identities told in delicious bite-sized chapters. You won't want to put it down, but if you do, you will come back to it again and again... At last, one of the very first ebooks is restored to its full glory." From the day they are born, Abraham and Adam Schlemiel create humor and cause trouble. No one, not even their parents, can tell them apart, which is sometimes and advantage, when they want to get out of chores. But when Adam falls in love with a girl who thinks he's Abraham, it's a huge problem. Set in Chelm, the village of fools, The Brothers Schlemiel is both a tightly interwoven story of two lives, and a rambling picaresque novel filled with rich characters. Originally written as a weekly serial, it's a page turner that can be enjoyed a bit at a time, but will call you to keep going and just read a little more. The Brothers Schlemiel is a book to savor. It's a timeless book that resonates in today's fast-paced digital society. 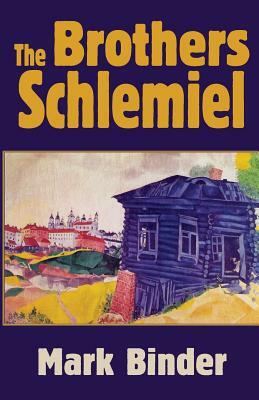 During its initial 100 installment newspaper run from 1999-2001, The Brothers Schlemiel was the first novel to be published serially via email. An abridged edition was published in hardcover in 2008. At last, the complete adventures of Abraham and Adam Schlemiel have been gathered together in one unabridged "authors cut." "To say that Jacob Schlemiel went temporarily insane after the birth of his twin boys might be to overstate it. The poor man certainly had a breakdown. It was as if the mule pulling his wagon down the road of life had suddenly kicked him in the head." So begins one episode of The Brothers Schlemiel. Binder could have also been describing what's happening to traditional publishing. With the arrival of electronic serials and e-books, old-fashioned print is getting something of a kick in the head. As tech-savvy authors like Binder are exploring the Internet's possibilities, traditional publishers are racing to get into the game." "The return of serialized literature is long overdue and "The Brothers Schlemiel" seems the perfect work to introduce a new generation of readers to a method as traditional as Dickens using technology that Jules Verne could only have dreamed of." "In The Brothers Schlemiel, Mark Binder tries to capture the community of Chelm in all its innocence, foolishness and humor. ...the mix-ups are many and the potential for laughter abundant"